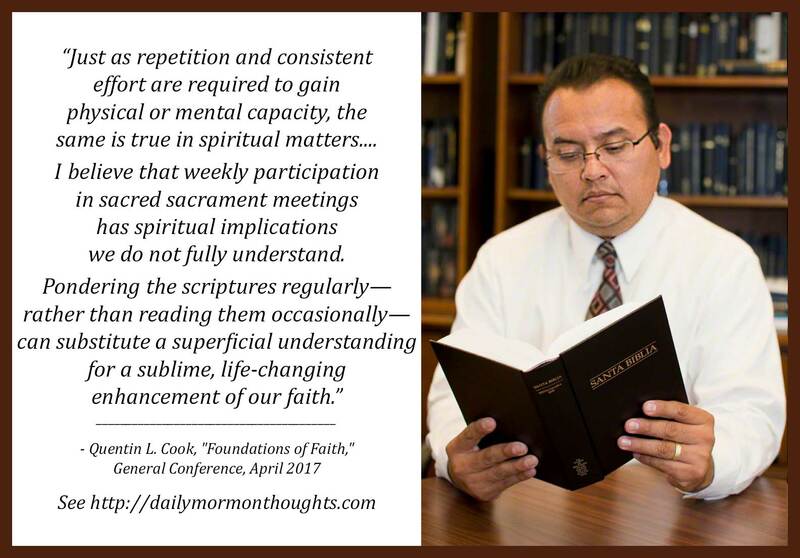 "Just as repetition and consistent effort are required to gain physical or mental capacity, the same is true in spiritual matters. Remember that the Prophet Joseph received the same visitor, Moroni, with exactly the same message four times in preparation for receiving the plates. I believe that weekly participation in sacred sacrament meetings has spiritual implications we do not fully understand. Pondering the scriptures regularly—rather than reading them occasionally—can substitute a superficial understanding for a sublime, life-changing enhancement of our faith." Many things that matter in our lives take significant time to develop. This applies to intellectual learning, physical abilities, proficiency in a talent, etc. 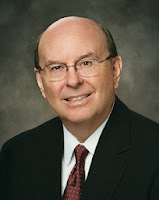 Elder Cook's point is that the same persistent effort is required in spiritual development. We grow "line upon line, precept on precept" and need to recognize the power there is in consistent, persistent efforts over a long period. I thought this point was particularly important: the "moments of sublime spiritual understanding" are critical to us—those spiritual high-points when we have revelatory experiences or profound spiritual experiences. But they are not the things that build "enduring faith" and "constant companionship of the Spirit" in our lives. Those things come from our steady, repeated, personal "individual religious observance." This message should encourage in each of us an examination of our "steadiness" to ensure that we are continuing to do the things that will bring that ongoing strength.